Find our cheapest flights to Tairāwhiti Gisborne from Auckland and Wellington. Tairāwhiti Gisborne is the first city in the world to greet the sun each morning. It's known for wonderful food, wine, culture and surfing. There's a lot to love about Tairāwhiti Gisborne. It has a gorgeous coastline, plenty of sunshine and a reputation for turning out award-winning chardonnays. It also has an easy-going mood that makes it very easy to slow down and appreciate the finer details of life. Sip a nicely-balanced pilsner brewed at the local Sunshine Brewery, tuck into perfectly crisp fish and chips, and enjoy the ozone scent of the Pacific Ocean as it rolls perfect waves onto the beach. That's the Gizzy way. The tracks wind around ponds and lakes, revealing amazing vistas at every corner. If you pack a picnic, you could make a whole day of it. When the sun gets up, Tairāwhiti Gisborne is the first city to see it. The best place to catch the sunrise is Kaiti Hill, also known as Titirangi. As well as blockbuster views, this park has a pohutukawa tree planted by Princess Diana, an observatory, a WWII gun emplacement and a fitness course. It’s one of the most popular places to go in Tairāwhiti Gisborne. Another truly Eastland experience is Eastwoodhill Arboretum. It's the tree equivalent of an art gallery, with the largest collection of northern hemisphere trees south of the equator. You don't have to be a botanist to enjoy this park; wandering the many pathways is simply a beautiful way to get connected with nature. The tracks wind around ponds and lakes, revealing amazing vistas at every corner. If you pack a picnic, you could make a whole day of it. A little further on from Eastwoodhill is Rere, a popular Tairāwhiti Gisborne attraction. Here the Wharekopae River delivers a heavenly cascade of water that’s 20 metres wide. You can do more than look at Rere Falls, because the reserve includes the amazing mossy Rere rockslide for 60 metres of unstoppable fun. Some kind of inflatable water toy is recommended for this natural waterpark sliding experience. There's a lot of history in Tairāwhiti Gisborne. It's where the Māori waka (canoes) Horouta and Tākitumu first landed, and it's also where Captain Cook first set foot on New Zealand soil in 1769. If surfing history is more your thing, you'll be interested to know that stand-up 'zip boards' were first used at Wainui Beach in 1959 and the famously long rides of Makorori Point were discovered by local surfers in the early 1960s. If surfing history is more your thing, you’ll be interested to know that stand-up 'zip boards' were first used at Wainui Beach in 1959 and the famously long rides of Makorori Point were discovered by local surfers in the early 1960s. The Makarori Hill walk and lookout provides a great spot for watching the local surfing and kitesurfing expertise. Many of the best restaurants in Tairāwhiti Gisborne are clustered around the river mouth near the port, so you can enjoy a delicious meal in a waterside setting. Here you'll also find some of the best Tairāwhiti Gisborne cafes and bars, plus there’s a riverside walkway for stretching your legs after eating. 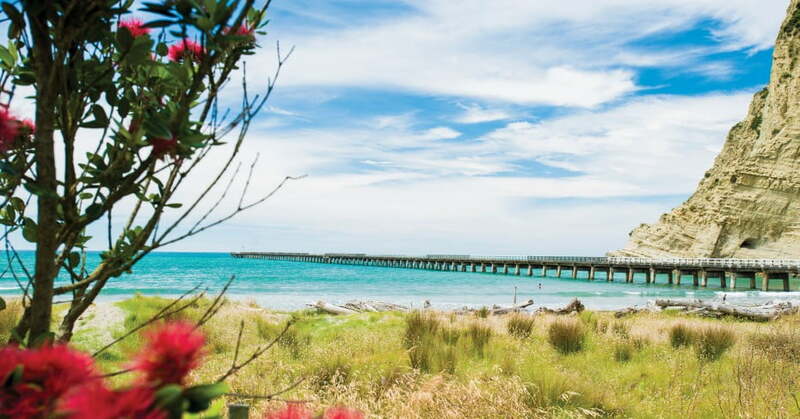 While there's no shortage of places to go and fun things to do in Tairāwhiti Gisborne, a lot of people also choose the city as the start or end point for the iconic road trip around East Cape. Usually taken at a relaxed pace over two or three days, it's a windy scenic drive through a quiet and incredibly beautiful part of New Zealand. You can even detour from Te Araroa to visit the historic East Cape Lighthouse, about 700 steps up from the sea on New Zealand’s most eastern point. Sunrise image courtesy of gisbornenz.com; Gisborne sunrise image courtesy of gisbornenz.com. ; Coastal view image courtesy of Activate Tairawhiti; Couple at Rere Falls image courtesy of Damon Meade. ; Eastwoodhill Arboretum image courtesy of Brennan Thomas.